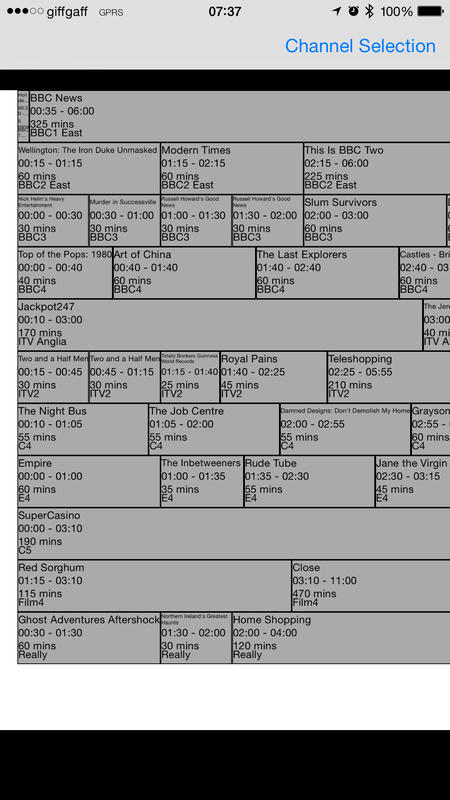 A little later than intended, here’s the follow-up to my first posting on building an EPG. So, having marshalled the data into a structure that can be displayed, on to the guts of this app, which is the main UIView for guide itself. The pre-requisite of that main view is configuring the scrollView: I’m not going to dwell on this too long, as it’s a well documented feature. For the formatting of the content in that classic programme guide UI, with rows of variable width cells, I initially started with looking at collectionViews, but couldn’t find a way of doing it – or certainly an amenable way. I also briefly looked at customising a tableView, which I could add multiple elements to, but rejected it for the same reason. 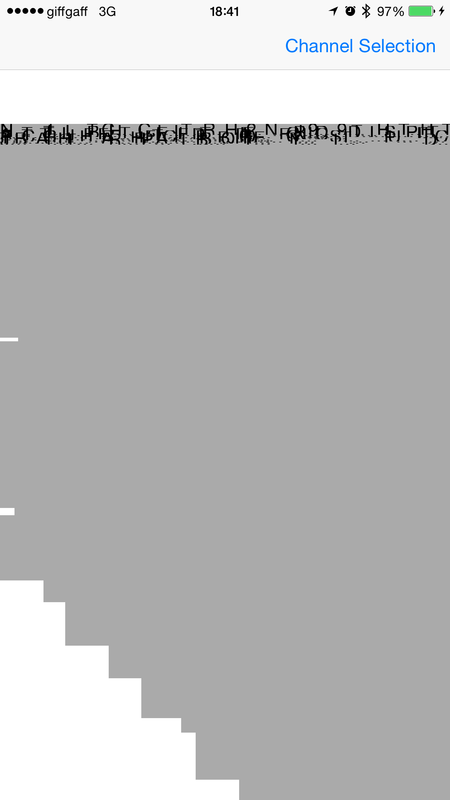 the width: the duration in minutes divided by the number of minutes in the day, then multiplied by the width of the scrollview. the height: this is a constant for all the cells, just based on experimenting with the scrollView. Before I go on to calculating the [X,Y] coordinates of the top left corner of the subview, I need to recap on how the programme information is written to Core Data and then read back. At some point in the implementation as I envisage it, it will be possible for the user to both download more programme data, as only a couple of weeks worth come down at a time, and also to configure which channels to do the download for. For ease of simplicity of managing the stored data, I decided to write all of the programme data to the same Core Data entity [think database table], and when the user repeats the download, with or without changing the channel configuration, I delete the existing data – a fairly blunt but effective instrument. …where the progOrderNum is the corresponding attribute in the Entity. The idea here is to calculate the width, as described above, and create the UIView [with a couple of frills like a border], and then return the X co-ordinate for the starting point for the next view. The Y coordinate is a simple calculation: I assign the channels a number, and then multiply that by the height of each cell. That, in essence is the primary logic for building the ‘wireframe’ for the programmes. I extract the text for a given programme’s title, start and end times, etc, and add those as labels programmatically. Again, these are calculated as offsets from the starting X coordinate and the calculated Y based on channel number. It really is a thing of beauty :). Obviously a refinement is required, so first port of call was to make 5am the equivalent of the left edge of the scrollView. I decided that, rather than hardwiring this into the search parameter for the NSPredicate – in case I changed my mind later – I’d do it when looping through the channel data. So first of all, I see if the start time of the given programme is >= 5am. If not I disregard it. If it is, I then calculate the offset for the X coordinate. This is based on calculating the difference between the start time of the programme and 5am in minutes. I then divide this by the number of minutes in the day and multiply it by the width of the scrollView. There’s an additional offset [which actually applies to all of the programme UIViews] for a channel title list down the left hand side of the scrollView. // So: the left edge of the view equates to 5am. // formatting from just HH:mm didn't work because the progStartTime has a date. It would, of course, be necessary to do the same for the right hand of the scrollView, to make sure that for a given cell, there’s enough room to display it. I haven’t gotten round to this yet, so late finishing programmes dangle precariously into space. Next up I’ll talk about creating the pop-up view for the programme details, including navigating an ARC related memory error, which took me a loooooooong time to figure out!